Jeffrey Yohalem wanted the blockbuster video game he wrote this year to be different. He wanted Assassin's Creed: Brotherhood to say something about the world today, if he could get away with it. Although few people expect blockbuster video games to carry political messages or weighty ideas, the 27-year-old Yohalem wanted the game to go after powerful people and correct a mistake promulgated by Barack Obama. While writing this game for his employer, the giant gaming company Ubisoft, he wanted to use the game to criticize the power of large corporations. "We'll see how it turns out, or if they end up clamping down in the future," he told Kotaku in a telephone interview. So far, with the game out for three weeks, he thinks he's pulling it off. In trailers and TV commercials, Assassin's Creed does not look like a game rich with 21st-century political criticism and advocacy. It doesn't even look much like a "Daily Show for the Renaissance," which was a guiding principle for one side portion of the game Yohalem wrote. As it is advertised, however, Brotherhood looks like a game about assassinating bad rich people in late 15th-century Rome. This is the manner in which you play most of it and the reason many people find it fun. 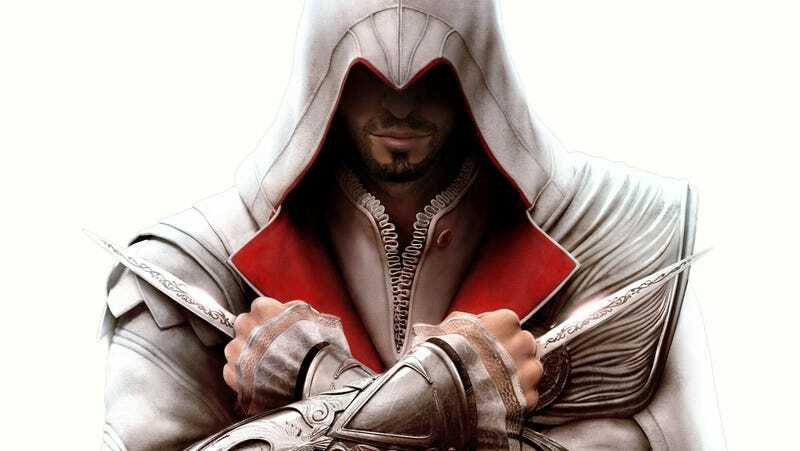 As Ezio Auditore da Firenze you climb churches and Roman ruins, collect intelligence from Niccolo Machiavelli and Leonardo da Vinci, trail Italian nobles and swoop down to stab them. The new Assassin's Creed doesn't look like a game that is going after modern Supreme Court decisions (even though it is), nor one that had content cut out of fear that the President of France would sue over it (it did). Is This The Year&apos;s Most Liberal Video Game? The game is not obviously a treatise on how to be a leader in the 21st century, though that too was intended by Yohale, who was part of a small team of creative leaders on the hundreds-strong Brotherhood development team. Players who read Yohalem's mocking descriptions of Renaissance landmarks — written in the voice of the game's sarcastic modern-day historian Shaun Hastings, should at least be able to see that "Daily Show for the Renaissance" element. The ambitious Yohalem moved to Montreal a few years ago after he fell in love with the artful Ubisoft video game Prince of Persia: Sands of Time. He had concluded his thesis at Yale and an internship at Jon Stewart's Daily Show. The American traveled to Canada. The Prince of Persia game "moved me," he said. "I wanted to work for the company that made it." To Ubisoft Montreal he went, helping to write the 2008 anti-terrorist game Rainbow Six Vegas 2, for which he riffed on the sniper scene from Stanley Kubrick's Full Metal Jacket. For 2009's Assassin's Creed 2, he worked with the lead people behind Sands of Time. They let him work on some of AC2's hidden areas where he could tinker with greater liberty. There is a lot of room in the Assassin's Creed games for a writer to play. The series' adventures are more complicated than they first appear. They are not strictly historical action pieces. They are actually pieces of a saga about a man named Desmond Miles who, in the year 2012, uses a machine that allows him to live the memories of his ancestors, one of whom was a Renaissance assassin. Desmond and Ezio are on one side of a generations-spanning conspiracy, a situation that allows the writers to weave history's great figures and events into the narrative of their long conflict. For Assassin's Creed 2, Yohalem got to write — and design — sections of the game that involved hidden messages and puzzles that, when solved, elucidated some of the events of the lengthy conspiracy. He was a childhood fan of puzzle books like the Eleventh Hour, so this was a perfect task. An Assassin's Creed game could be "a video game was that was talking about modern day politics, instead of all these cheesy stories that pretend to be about reality..."
An Assassin's Creed game, Yoahelm came to believe, could be "a video game was that was talking about modern day politics, instead of all these cheesy stories that pretend to be about reality but use fake names in different time periods." Writing in the names of political figures wasn't enough. He had something to say about some of these people. By the time he was writing Assassin's Creed Brotherhood earlier this year he was infuriated with the Supreme Court. He was angered by the Court's early 2010 decision in the Citizens United case that affirmed that corporations deserved the same rights of Free Speech in the United States as regular citizens — and enabled them to more freely donate money to political campaigns. "It upsets me," Yohalem said. "I just feel that a corporation is obviously going to be way more powerful than an individual, because it's a group of individuals and they've pooled all of their resources. Treating them like individuals makes individuals the underdog, which is not what America is about." Yohalem wanted to get his frustration into the game. He wasn't going to make a metaphor about it. He went after the Supreme Court, creating a puzzle that magnified the corporate connections of President George W. Bush, former secretary of state Condoleezza Rice and the right-leaning members of the United States Supreme Court." The game's puzzle (which you can see the partial solution to in the video here) implies that America's 21st-century leaders have been at least as beholden to big companies as they have been to the nation's citizens. Part of what was unusual about what Yohalem was doing was that he named names and made political arguments about them in a big-budget video game. He didn't use fake stand-ins. He used real figures, some of whom, including eight of the nine justices featured in the Brotherhood puzzle, are still hold their government offices. "That was totally intentional and it really made me think of MTV when it first came out," he said. "Anything current always ends up falling apart before the game is done." "That was really my intention to do something that had never been done in video games before, that dealt with topical issues that video games hadn't been able to do in the past because they take so long to develop." Most big video games usually take at least two years to create. "Anything current always ends up falling apart before the game is done." Ubisoft's legal team had to review Yohalem's writing and his political puzzles. They okayed most of it, and the writer commends his bosses for being "brave" and letting him go after his targets. It helps that he saved this stuff for the game's hidden corners. Most of the game's most political stuff is hidden in the puzzles that are themselves hidden in the game; many Assassin's Creed players will never encounter them. "The reason I got to put it into the game at all was because it was obscure." The only omission Yohalem mentioned to me was the removal of some content critical of current French president Nicolas Sarkozy. "Apparently Sarkozy sues and wins all the time." Yohalem wrote the main script of Assassin's Creed Brotherhood too. He didn't just work in the margins. The main plot is set in the Renaissance and features the assassinations present in the game's TV commercials. It is not the part that attacks modern political figures. It is, however, the part about which Yohalem sounds the most personally driven. In this main portion of the game the player drives Ezio on a path the hero assassin believes will put him in charge of a guild of assassins. This would make him the head of the game's supposed good guy faction in its grand conspiracy. With Machiavelli as a supporting character, it's little surprise that that narrative feels on its surface as one molded by the Renaissance thinker's most famous writing on leadership, The Prince. The book is legendary for endorsing and encouraging a scheming and unsentimental approach to wielding power. Ezio's story is about leadership and how one man rises in influence and power. "I looked at The Prince and kind of studied what characteristics in the Renaissance would make a real leader," Yohalem said. "Through Ezio's story and through the ideals expressed by him and his enemies, I tried to illustrate what the issues of leadership were in that time period." These Machiavellian ideals involve, among other things, an assertion of power, a strengthening of one's financial resources, a securing and gauging of alliances. Early in the game Ezio expects he will be immediately given a leadership position. After all, he graduated from the previous game, Assassin's Creed II, a hero. He is stymied. Yohalem wanted to make a modern point about this. Assassin's Creed Brotherhood, he believes, can be a corrective against a young person's sense of entitlement and a caution to those who may hope or believe that merit alone will grant them authority and power. "Kids come out of college, encounter the workforce and this power hierarchy they're not used to and they have no idea how to gain levels in that power hierarchy." "I feel like now kids are taught in America you can be anything, do anything — everyone in your class is your equal — and it's all about whether you're smarter than them or not. And I think the workforce is not structured that way at all. Kids come out of college, encounter the workforce and this power hierarchy they're not used to and they have no idea how to gain levels in that power hierarchy. I think it's incredibly frustrating both for them and the people who are currently employed." Assassin's Creed as prep for life after college? Why not, as long as people refrain from using Ezio's blades. Yohalem knows that there are low expectation for writing in video games. He's not even a fan of a lot of it and understands much of the effect of good or bad writing in games can be missed. "That's the incredible thing about video games," he said. "Because they're so big, you're allowed to play as a writer in a way you'd never be allowed to play with on TV or in a film... the content of your writing is not under the scrutiny it would be in a TV network or a movie studio because it's not the heart of the experience. So they're not worried that something you write is going to to destroy the sales of the game because it is optional and not everyone has to look at it." In other words, games are so big, Yohalem asserts, that writers can and should play in them. Maybe the bosses won't even catch them in the act, and maybe legal won't mind. In the past, that spaciousness could have been the excuse for game writing to be bad or toothless or unambitious. In Yohalem's case — and surely, hopefully he's not alone — it can be the excuse for writers to make a game say something. Let one or another blockbuster take a stand. Let's see how that falls.